Are you working to increase lab sales leads and market life science products in Pittsburgh? Biotechnology Calendar, Inc. life science marketing events in Pennsylvania may be just what your company needs to get the brand recognition you are looking for. Our Pittsburgh BioResearch Product Faire™ Event will be held on the University of Pittsburgh campus on June 12th, 2014. This event is a great way to meet researchers, lab managers and purchasing agents intent on learning about the latest lab products and services available on the market. Biotechnology Calendar, Inc. events attract large crowds because our shows are located on campus within walking distance of researchers’ labs, offices and classrooms. Being on the University of Pittsburgh campus is a great benefit for exhibitors at our life science events because we provide lab suppliers a legitimate reason for being on campus. Often, campus security will prevent companies from engaging in door-to-door marketing as a way of getting the word out on lab products and services. Researchers feel comfortable meeting sales reps at our event because of our university sponsorship. We do a great deal of pre-show advertising and send out event invitations to ensure that researchers know when and where our event will be. We cater our events with a delicious lunch that helps keep the conversations flowing. Not only does this encourage researchers to come to our events, but the atmosphere the food and on-campus facilities supply create an incentive for researchers to stay through the end of the show and discuss their problems in the lab with exhibitors. Lab suppliers interested in marketing their life science solutions at the University of Pittsburgh may want to know more about the university’s funding statistics. The NIH awarded the University of Pittsburgh $419.5 million in 2012, while the NSF gave the University of Pittsburgh $24.7 million in 2012. In 2011, the NIH ranked the University of Pittsburgh sixth for direct plus indirect costs in the life sciences, excluding R&D contracts and ARRA awards, making the total $416.3 million. For more University of Pittsburgh funding information, please read our blog University of Pittsburgh awarded $444.2M in Research Funding. 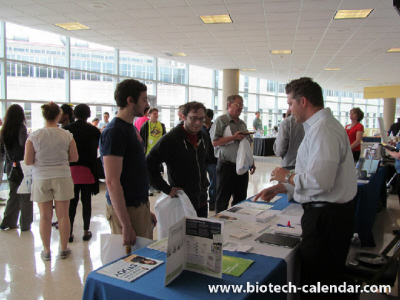 Biotechnology Calendar, Inc. invites lab suppliers interested in working to increase lab sales leads and marketing life science products in Pittsburgh to network with science researchers at our next Pittsburgh BioResearch Product Faire™ Event on June 12th, 2014. Last year, the Pittsburgh BioResearch Product Faire™ attracted 392 attendees, of which 77 were purchasing agents, professors and post docs, and 51 were lab managers. The balance of attendees was research associates and postgraduate students. Biotechnology Calendar, Inc. is a full-service science research marketing and events-planning company that organizes life science events at top research universities across the country. If you’d like to increase lab sales leads and market life science products at life science events closer to home, we encourage you to view our 2014 calendar of events. For more information on our Pittsburgh BioResearch Product Faire™ Event, or to view more funding statistics for the University of Pittsburgh, click on the button below.